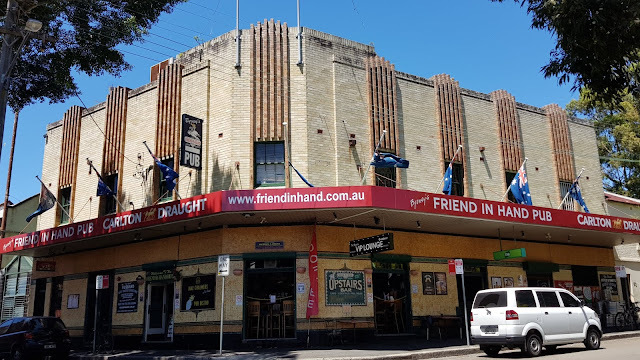 The Friend In Hand Hotel is located on the corner of Cowper Street and Queen Street, in the inner city suburb of Glebe. This heritage listed pub was designed by R.M. Joy, architect for brewery Tooths & Co and built in 1937 in the Inter-war Functionalist style with Art Deco overtones. It seems to have now been renamed Byrnsy's Friend in Hand Pub. Linked to: Theme Day, Signs, Signs, Thursday Doors. A distinctive building, and a good take for the theme, Jim. That's an interesting take on the theme! ...I like the Art Deco touches. A building were it is not practice to let daylight in by the look of it. A clever take on the theme. I checked out the link, and what a fun neighbourhood pub this seems to be!! That's great for the theme, nice one! Good interpretation for the theme, and an interesting building. Nice one for the theme, Jim! Love the building. It is nice... Thank you so much for sharing about heritage pub "friend in hotel". It's design looks nice.